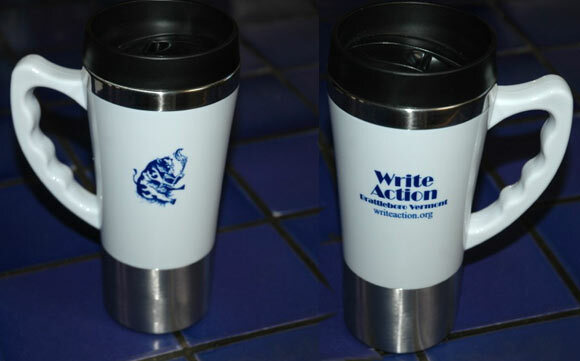 Get your Write Action Travel Mug with Write Action name and "logo" just in time for the holidays. Attractive, easy to use with tight-fitting lid and sliding tab for convenient, non-spill drinking. Comfortable handle. Slim design to fit into car holder. It's a great way to support Write Action, and creative writing in general. Just $10 a mug. Order now through PayPal. The year 2010 marks a decade of Write Action’s grass-roots support for local writers and writing. To celebrate, the non-profit organization presents its second collection of poetry and prose from writers living in Brattleboro and the surrounding towns. In Write Action's anthology, we enter death as a country, witness the majesty of hawks in winter, and experience the hippies of the 60s under the eyes of the benevolent marijuana gods. At turns sexually brazen, gracefully melodic, and laugh out loud funny, this is an astonishing collection of remarkable range. Quite simply, it's not to be missed. There is humor and hubris, sadness and celebration, strength and weakness, blood, sweat, toil and tears. In short, the sum of our lives - all contained in 200 engaging pages…One of the real gems of 2010. This impressive collection presents old and new voices to the reading public. Through the poetry and prose, it offers a unique window into Vermont's contemporary writing landscape. Dave Ritchie in his poem “Why Locovore Writers?” conjures an apt metaphor for the local appetite for verbal sustenance: What about ‘fresh’?/That’s how we want our vegetables./ As recently harvested as possible./ I would like that with my neighboring author./Let her revelations start with us! And so they do. Write Action T-shirts are now on sale. Be the first on your block––or cow pasture––to have this cool article of clothing! Available in men’s and women’s styling, pre-shrunk 100% cotton, with Write Action’s distinctive logo/mascot, our literary cow, on the front. Designed and drawn by artist Aaron Distler, Brattleboro native, alumni of the Putney School and Rhode Island School of Design. The T-shirts come in five (5) colors: gold, black, cobalt blue, red, and lavender. Women’s style has a lower neck-line and cap sleeves. It is available in black, blue, and lavender. Men’s standard T-shirt styling comes in all colors except lavender. Sizes for both men’s and women’s styles are S, M, L, XL. For photos of our members modeling the new t-shirts, please click here. 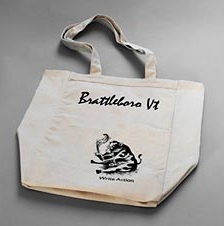 T-shirts cost $12, payable to Write Action, via PayPal here on the Write Action web site or send a check to Write Action, PO Box 822, Brrattleboro, Vt 05302. Be sure to include size and color. Please add $2 for shipping and handling. The Write Action Book Bag, with the Write Action "mascot" on the lower right corner, drawn by artist Aaron Distler (a Putney School, and Rhode Island School of Design graduate who has shown his etchings and drawings in galleries on the east and west coasts), is available for $12 each ($10 each for an order of three or more bags, if paying by check). 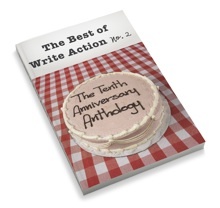 Also available is the classic collection, "The Best of Write Action" from 2003, which contains the writing of 65 local authors, at $12, which includes shipping (the original price was $16.95). your local grass-roots writers' organization.